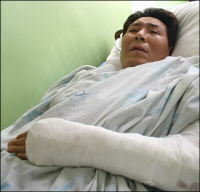 In the last three weeks of March, 2010 the government of Kyrgyzstan managed to nearly eliminate the independent journalism that has been emerging and developing in the republic since gaining independence in 1991. The independent newspapers, regularly counting the number of days, remaining till the end of President Askar Akaev’s presidential term, at the front pages, do not exist anymore. The live and uninterrupted broadcast of multi-day opposition meetings in central square of Bishkek is already the history. The journalists will not ask the President or Minister inconvenient and open questions, shocking the press-officers of the state agencies. There are no live programs in the First State Television channel of Kyrgyzstan, attended by the opposition leaders and President Kurmanbek Bakiev, when the Kyrgyz leader openly debated against his opponents. The local mass media cancelled "the watch of correspondents in the parliament" although the parliamentary correspondents daily reported the sensational statements of deputies, both from opposition and pro-government side. The commencement of "silent mode"
The new page in the history of Kyrgyzstan was turned up on March 10, 2010. People are getting used to information vacuum: even if there are important political events in the republic most of people will never learn about them. In the last few days three opposition newspapers were shut down, the local and international online media were filtered while the local news agencies were agreed (or forced) not to cover certain political agenda. The most recent attack was attempted on April 1 at independent Stan TV internet television. The financial police officers showed up in the office of Stan TV channel and brought the Microsoft representative that said Stan TV was running unlicensed software at the computers. The human rights defenders, arriving shortly, blocked up the entrance door and kept the financial police officers outside for about an hour. "The computers in the financial police office have the same illegal software" the IT engineers of Stan TV and human rights advocates noticed. "We do not even use our computers" the financial police officers mentioned in response. Ultimately, the authorities sealed the equipment and server room and, therefore, stopped the broadcast. The journalists were not even allowed to take their office laptops. It is sad that the journalists were not even attempting to resist the law enforcement officers. Obviously, the journalists were internally ready for such events. People remember well the murder of Alisher Saipov and Gennadiy Pavlyuk, the severe beating and knife injuries of Syrgak Abduldaev. When you know exactly what can happen to the journalists in this country, the filtering of website or sealed editorial office may seem the simplest pay for your work. The thing is that comparing to what THEY can do to you, the current losses are nothing. Good thing is that you are alive. Today, the Kyrgyz journalists work in the following system of axes: "killed-not killed-severely injured"; the self censorship turns on automatically. The question "what will happen to my kids" becomes the priority and people leave journalism through either changing the occupation or adopting the censorship, which is still the abandonment of journalism. Today, there is no more free journalism in Kyrgyzstan. The reason why Kyrgyz authorities decided to reinforce total "silent regime" is the scandal, involving international financier Eugene Gourevitch, whose company managed significant state assets. These assets were transferred to Gourevitch by Kyrgyzstan’s Development Fund, headed by Maxim Bakiev, the son of the president. The news, delivered by various agencies, on the fact that Italian court issued the arrest warrant for Gourevitch, de facto personal financial consultant of Bakiev’s family, became the signal for the President’s Secretariat and secret services to start filtering domestic access to the websites of Ferghana.Ru news agency, Centrasia.Ru, Belyi Parus online newspaper. The broadcast of Azattyk radio (Kyrgyz Service f RFE/RL) through private radio and TV channels was also shut down. If earlier the government struggled with certain opponents and journalists one by one, now, apparently, it was decided to put systematic pressure on political opponents and independent mass media. The establishment of strict vertical power system and suppression methods, used against the opposition and mass media, were successfully adopted by Kurmanbek Bakiev from the neighbors, especially considering that other presidents in Central Asia were hinting that Kyrgyzstan must not be "an odd bird". While the independent mass media were closed in other countries of the region Kyrgyzstan remained the area for regional conferences, round tables and seminars, attended by the representatives of such isolated republics as Uzbekistan and Turkmenistan. This was certainly irritating the authoritarian regimes, surrounding the republic. Bakiev is well aware that strict policy in cleaning up the political field will be supported by all regional leaders – in any case, Kyrgyzstan without revolutions, demonstrations and political struggle is more attractive partner than Kyrgyzstan in 1991, 2005 and 2007. If Karimov, Nazarbayev, Berdymukhammedov and Rakhmon are not even thinking they can leave their positions – Bakiev must also reinforce his (or his family) life-long position in the political Olympus of the region. This means that the image "island of democracy" in the region is not valuable any more. Who needs this image if today the United States need Kyrgyzstan as well as vice versa? While the war in Afghanistan is in progress, the United States will pay for Manas, build training center in the southern region and ignore such effects of Kyrgyz state building process as the murders of journalists and politicians, faked criminals cases, severe verdicts for non-compromising opposition leaders: USA and Europe have their own interests in Kyrgyzstan; sometimes their very democratic policies view the violation of human rights and freedoms as "domestic affairs of another state". The only remaining hope of the opposition and independent mass media is the support of people. Today, the national protest potential is quite high while Kyrgyz ability to mobilize is well known. The Central Executive Committee of People’s Kurultai issued the statement, saying "To protect the freedom of speech! "; it also mentions that similar situation with shutting down the independent media was observed on the eve of tulip revolution of 2005: "That was the time when newspapers, website and independent TV channels and radio stations were blocked. Neither Akaev nor Bakiev will be able to hide the truth from people. Very soon the Kyrgyzstanis, attending the assembly meetings and kurultai, will give their own valuation to this regime and decisively demand to rebuild the sovereignty. The filtering of media is not the obstacle for people, but will give additional determination and courage! The executive committee addresses international community with the appeal to show solidarity to the people of Kyrgyzstan in their struggle for justice, rule of law and constitutional freedoms! The executive committee urges all Kyrgyz citizens to show courage and human dignity, stand up to protect freedom, the right for worthy life and people’s rule!" The Stan TV staff in Bishkek also asked for the support of "the governments of democratic countries and the leaders of international organizations". Understanding the fact that the suspension of channel operations had to be necessarily approved by the highest authorities, the Stan TV staff believes "the unprecedented action against independent media source must produce public resonance and adequate response of the world community… We urge the leaders of democratic countries and the representatives of international organizations to pay attention to the events in the information area of Kyrgyzstan and judge the government of the republic, violating the constitutional rights of citizens for getting objective and truthful information". There is no money for the development of independent Kyrgyz media: the West does not provide grants any more while poor economic development hinders the financial success of the media projects. The pressure on journalists, put by authorities, is extremely intensive. Today, Kyrgyz journalism is hiding in the cocoon of fear and despair, waiting for the better times.